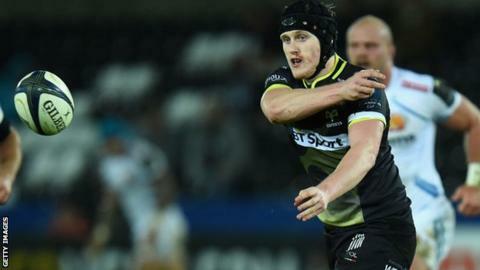 Ospreys wing Dafydd Howells is out for up to five months after undergoing surgery on a hamstring injury. The 20-year-old Wales international was hurt in the dying moments of Ospreys 23-13 win over Exeter on 15 November. "To ensure the best result for Daf the decision was for him to have surgery to repair a damaged tendon," said Ospreys official Chris Towers. "He will have a slow recovery period and is looking at four to five months before he'll be able to play again."